Disney's Frozen Olaf Pillow Just $5.98! Down From $16! You are here: Home / Great Deals / Disney’s Frozen Olaf Pillow Just $5.98! Down From $16! Disney’s Frozen Olaf Pillow Just $5.98! Down From $16! Right now you can get this Disney’s Frozen Olaf Pillow for just $5.98 (Reg. $16) at Walmart! You can get FREE shipping on order over $50 or FREE in-store pickup! Snuggled up in bed with Disney’s Frozen Olaf pillow buddy your child will fall asleep dreaming about their next fun day playing in the snow. Olaf is everyone’s favorite snowman! He has a soft snuggly body, carrot nose, twig arms and a happy smile. Pillow Buddy is 100 percent polyester fleece making it easy to clean, so your little one can take him along on family road trips, sleepovers or a car ride to the market. Olaf is ideal to snuggle up with at nap time or while sitting on the couch watching their favorite Disney movie or TV show. 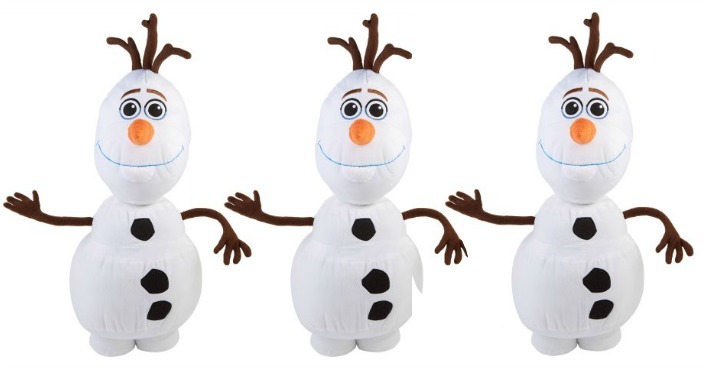 Pair the pillow buddy with the comforter, sheet set, drapes and blanket to give your child the perfect Frozen Olaf bedroom. Click here for the full Walmart FREE & $1 Or Under Deals list!